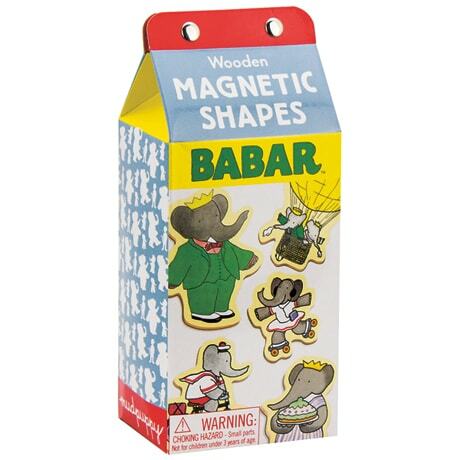 Tell your own tales of King Babar, Queen Celeste, and the other elephants of Celesteville with these magnetic wooden figures, based on illustrations in Jean and Laurent de Brunhoff's much-loved picture books. Measuring between 1½ to over 3 inches high, the 35 character shapes can be arranged on the refrigerator or any other flat metal surface. The set, made from 80 percent recycled wood, is presented in a colorful, milk cartonshaped box with snap closures.